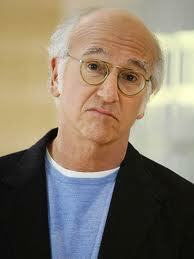 Is Curb Your Enthusiam’s Larry David a first class jerk or kind of “coach-y”? Next post: This is why I haven’t been blogging much lately…. Last night’s episode of Curb Your Enthusiasm can only be described as hilarious. I’m a huge fan of the show, so imagine my delight when Larry David popped up on an airplane eating Pink Berry and complaining about his long shoe laces. Midway through the flight, after finding the first class lavatory occupied, Larry does what most first class passengers would never do. He whips back the blue curtain and enters coach. On his way to the back of the plane, a fellow passenger scolds him for crossing cabins after she’s been told she can’t use the first class bathroom. Larry tries to explain that he’s not a typical first class passenger. He’s “coach-y” That’s when the passenger accuses him of being “first class-y” It’s a funny scene you have to see. (CLICK HERE to watch) On his way back to first class, Larry trips on his shoe laces in the aisle and accidentally takes down a belligerent passenger in the process of abusing a flight attendant. Everyone in coach gives Larry a standing ovation. He’s dubbed a hero. Larry, of course, takes full credit for his bravery. His seatmate who wanted nothing to do with him, or his long shoe laces, earlier on in the flight now finds him attractive and slides him her phone number. She then goes on to compare him to Sullenberg. Season 8, Episode 76, The Hero. OK, you got me. I don’t do TV, but I think I’d better watch this clip. Thanks. Funny. I bet not too many of first class would do that, or someone in coach confront them. I like how while they are getting into it, the other passengers are snoozing.